Homeschooling Hearts & Minds: Socialization? What about it? Socialization...that scary "s" word that whispers in your ear every time your child's pediatrician suggests that a behavior problem might be due to a "lack of a peer-group" or when your mom quizzes you on her grandchild's "social activities". What is socialization anyway and how do we know if our children are on the road to becoming valuable members of society or if they'll have trouble even making friends? These are just a few of the important questions addressed in What about Socialization? 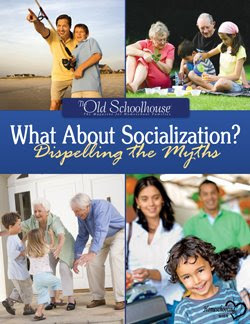 Dispelling the Myths, a brand-new e-book now available from The Old School House Store. This 45 page e-book contains 12 short, easily digestible chapters, 11 by homeschooling parents and the final one written by an 18-year-old homeschool graduate. Sometimes we need a gentle reminder of why we chose to homeschool in the first place. Was it to provide a superior academic opportunity for our children or to produce mature, well-rounded adults with exceptional character? This is not a "nuts and bolts" book that focuses on how to socialize your children. It was written for the Christian family and focuses a great deal on discipleship and raising children of good character. While there is practical advice on how to incorporate social activities into the homeschooling day, the real point here is to not lose sight of the Big picture. Let's embrace our role as parents, treasure the miraculous gifts that God has given us in our children, and fulfill our duty to educate those children in such a way that they can in turn have a God-centered life. It is in learning to be Christ-like that our children can and will be valuable members of society, not in learning how to "talk-the-talk and walk-the-walk" from their peers. This short book is filled with personal reflections by real people who share these same challenges, and while their thoughts are often comforting and even inspirational, this is a book to be read one chapter at a time, picking it up when you need a little pick-up, rather than plowing straight through to the end. Each author follows a bit of a formula by first defining socialization, and then sharing from personal experience. Admittedly, a straight-through read would be a bit monotonous, but I don't think this is the way it's intended to be read. There are a lot of little nuggets of wisdom here that shine brightly if taken a bit at a time. Perhaps you know a family who has been considering taking the homeschool plunge but the little "s" whispers are holding them back...or a family who spends their days running from one activity to another in an effort to fill the perceived void...or have you been hearing those whispers yourself? What a wonderful gift this could be, a gift of peace in the mind and heart, just in time for Christmas. To order your pdf of this book available for immediate download for $12.45, click here. Disclosure: I received a free copy of this ebook to facilitate my review. I received no other compensation. The opinions expressed here are solely my own.